Sophie Ellis-Bextor is best known for her 2001 hit 'Murder on the dancefloor'. 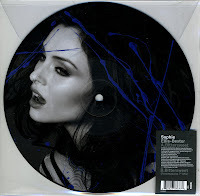 But she's still going strong, as is evidenced by this picture disc 7", released earlier this year. Produced by the Freemasons, this track sounds a lot like the Eighties classic 'Blue Monday' by New Order, yet sounds very contemporary. 'Bittersweet' was released on May 2, 2010 and reached number 25 in the UK singles chart.